Japan’s modern shipbuilding industry began shortly after the Meiji Restoration, when the government bought existing facilities, invested in new equipment, and later sold the shipyards to private companies. By the end of World War I, Japan was the third-ranked shipbuilding nation in the world. 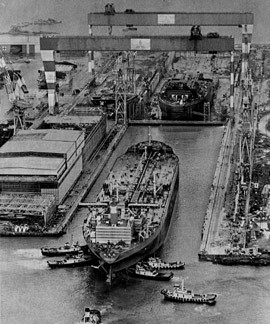 During World War II the industry came under government control and built ships primarily for military use. It used standardized mass production methods, but fell behind the technological development of other countries. After the war the shipbuilding industry had to begin anew, with necessary materials in very short supply. It recovered quickly with new imported equipment and technology, and began producing ships for export. By 1957 its production had surpassed the 1944 peak wartime production level. Since that time Japan has consistently ranked number one in the world in terms of new ship tonnage produced. From the 1960s through the 1980s, Japan produced about half of all new ship tonnage in the world. While it still ranks first, it now produces only about 38% of the world total and vies with South Korea for first place. However, in the 1970s and 1980s the shipbuilding industry suffered from two recessions, and became one of the industries targeted in Japan’s depressed industries law to help displaced workers.